I picked up this model of Kbs 443 stake car for a couple bucks at a 2nd hand store when I was in Germany the last time. What I didn't notice at the time was that the car deck was buckling because someone must have hit it hard enough that the weight sandwiched between the plastic layers for the deck and the frame had become dislocated. When I took it out of the box and put it on track, it was obvious that the car geometry was off. It took complete disassembly of the car and removal of two bent metal clips to get that straightened out. While I had it on the workbench I figured it would make a good candidate for a light weathering experiment with PanPastels. 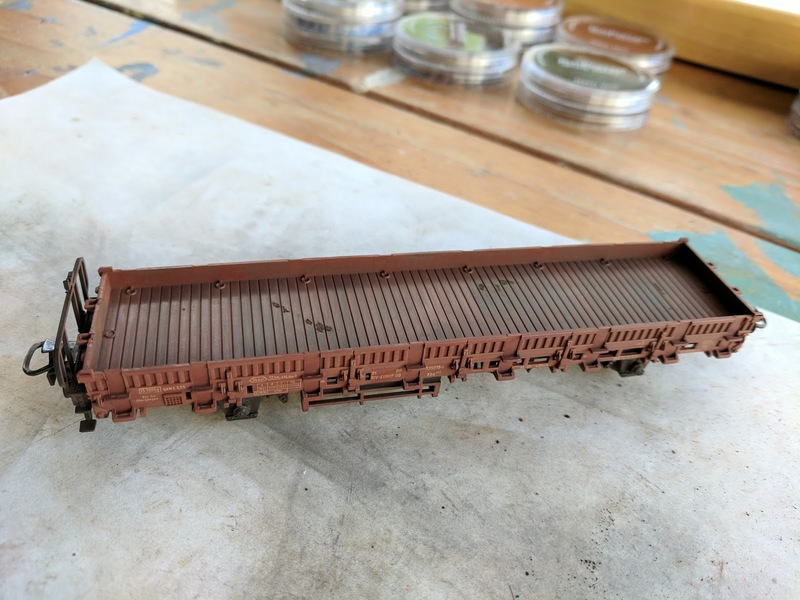 I started with the deck, mucked it up a bit with various shades of brown, umbra, and burned sienna, then went around the outside with burned sienna to both tone down the stock color of the car, as well as take off some of the plastic shine. Finally, I applied umbra around the axles, bearings, and springs. It took me longer to reseat the weight and fix the buckling deck than to get to this state of weathering. This is good enough for my purposes with this car. I'll seal it with a flat clear coat and it's good to go.